ROSEMONT— For the second straight game, the No. 13 Butler Bulldogs (17-3, 6-2 Big East) came out sluggish in the first half as they trailed by as many as 20 points, but like the Marquette game on Jan. 15, they found a way to come from behind in a 70-69 overtime win over the DePaul Blue Demons (8-12, 1-6 Big East) at the Allstate Arena, in front of 6,713 fans. Freshman Kamar Baldwin came up with the game-winning free throws with three seconds left in overtime and finished with 18 points and five rebounds in 36 minutes. Despite a career-high 32 points from Eli Cain and a 16-point effort from Billy Garrett Jr., highlighted by a conventional three-point play seven seconds before Baldwin's makes from the line. 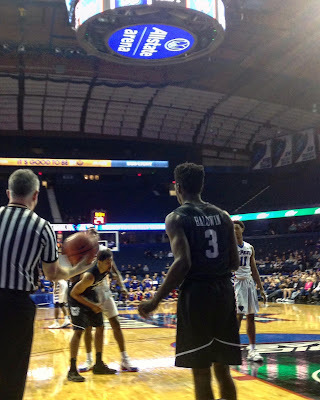 With freshman Levi Cook sidelined with a right ankle injury, DePaul's big man rotation of Joe Hanel, Tre'Darius McCallum and Al Eichelberger played a part in Butler's second-leading scorer Andrew Chrabascz being held scoreless on 0-of-5 from the field in 33 minutes. Butler could not find an answer with its perimeter defense early as Cain and McCallum continued to rain threes as they went a combined 6-of-7 in the first 7:08 to give DePaul its largest lead in conference play at 25-5. With their backs against the wall early, the Bulldogs went on a 16-1 run, highlighted by five points from Avery Woodson to pull within seven points at the 5:26 mark. The Blue Demons went ice cold from the field in that stretch going 0-of-7. Cain’s conventional three-point play stopped the DePaul bleeding after going 7:46 without a field goal and scored the final seven points. Butler answered on the other end as Kethan Savage delivered a splendid layup and a 20-foot jumper from the key to go into the half down 33-31. Butler took its first lead of the day on a Tyler Lewis three-point make 83 seconds into the second half, but a personal 7-0 run by DePaul’s Garrett silenced any momentum. The Blue Demons clung to their lead for the majority of the second half, until a 15-minute field goal drought gave the Bulldogs life as they evened the score at 59 at the end of regulation. The Bulldogs return to the hardwood on Jan. 25 as they look to make it four straight wins as they travel to Newark, N.J., to take on the Seton Hall Pirates while the Blue Demons return to action on Jan. 28 as they go to Omaha, Neb., to play the No. 7 Creighton Bluejays in search of their first true road win of the season.